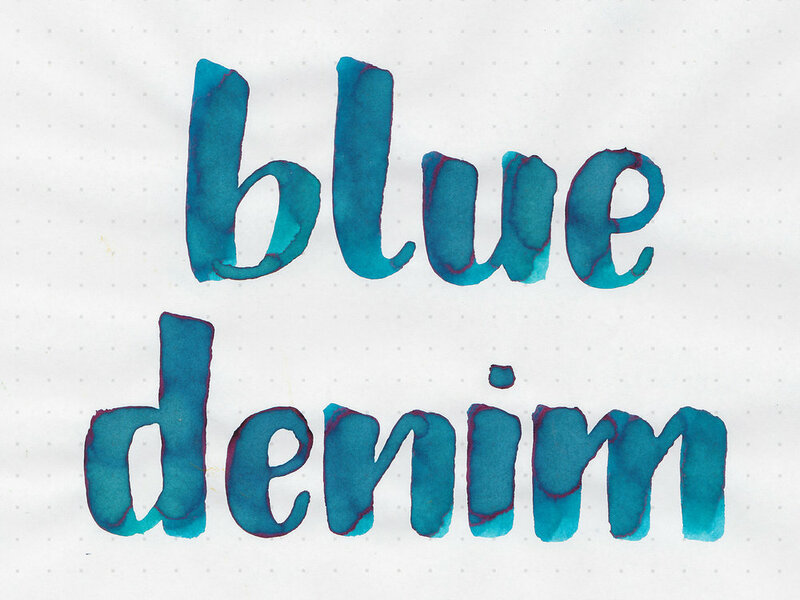 Today's ink is Robert Oster Blue Denim, a pretty blue with pink sheen. I purchased my samples of ink from Goulet Pens. Blue Denim is a beautiful medium blue with a slight green undertone. When pooled there is a pretty pink sheen. Ink swabs for comparison, left to right (top to bottom for mobile RSS): Robert Oster Frankly Blue, Robert Oster Blue Denim, and Blackstone Sydney Harbour Blue. Click here to see the Robert Oster inks together. Frankly Blue is a little bit more green and Sydney Harbour Blue is a bit darker. Robert Oster Lake of Fire, Robert Oster Soda Pop Blue, and Robert Oster Fire and Ice. Click here to see the blue inks together. I used a broad Pelikan M805 Ocean Swirl on Tomoe River paper. The ink had a nice wet flow. Overall, I really like this ink, and plan on buying a bottle. It's pretty well behaved, has some lovely shading and pretty pink sheen. Give it a try, you might love it.